Anna Maxwell Martin (standing, left ) stars as Julia in Motherland. 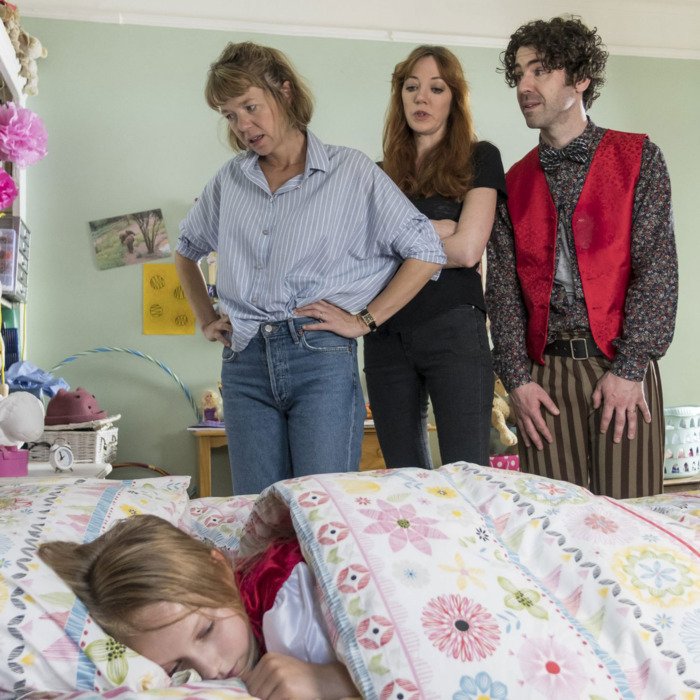 The annual Mother’s Day pop-culture primal scream continues tonight on Sundance Now with Sharon Horgan’s new series Motherland, one of the first sitcoms since Horgan’s Amazon dazzler Catastrophe to make me slightly injure myself while laughing. Anna Maxwell Martin (BBC’s 2004 Bleak House) stars as Julia, a working single mother who struggles to balance her duties as an events planner and a mother to two young kids. Horgan, who created and co-wrote the series, and Graham Linehan, who co-wrote and directed, have recaptured the vertigo-inducing sensation that parents of young children will recognize: As you’re scrambling from obligation to obligation and event to event, fighting to keep scheduling details straight in your mind, doing your damnedest to remember names of people and places you apparently no longer have the bandwidth to retain, and thinking of ways to ask for help without seeming as if you’re sloughing off your sacred responsibilities, time and space seem to collapse into a wormhole of mild desperation and isolation, to the point where you feel alone even when you’re surrounded by a potential support group. Motherland gets all of this and captures it with energy, audacity, and style; at its most frenzied, it evokes the final 30 minutes of Goodfellas, minus the cocaine, helicopters, and Harry Nilsson. The supporting cast includes Lucy Punch as Amanda, the snide, preening, de facto leader of the local “Alpha Mums” who acts as if she has a monopoly on virtue and maternal selflessness when what she actually has is a rich husband who supports her as a stay-at-home mother; Diane Morgan as Liz, a single mother who’s the object of a scurrilous rumor but really doesn’t give a damn; Paul Ready as Kevin, a stay-at-home dad who’s so eager to please that he allows himself to be treated as a human doormat; Oliver Chris as Paul, the heroine’s estranged husband, who is entirely oblivious to her mental disintegration; and dozens of bit players who pop in long enough to observe Julia’s distress while doing their best not to make her feel too self-conscious about it. I’m struggling to choose which incidents to describe here because most of them are so surprising, or juxtaposed in such an unpredictable way, that almost any details would constitute spoilers. Suffice it to say that if you made a private, personal list of challenges and disasters that have befallen you while trying to care for children, Motherland probably deals with them, in actuality or in spirit, from the wild rushing-about to an appointment that isn’t even happening that day, to the minor but revolting injury that has to be dealt with immediately even though there’s an important event going on. This is rich terrain that has been insufficiently explored by a comic mind as fearlessly audacious as Horgan’s. Motherland plants a flag there in its very first scene and commences building a legacy. This is an impressive series, and lots of fun, if you don’t mind revisiting or envisioning everyday, low-level trauma.